Approach any border crossing—those gateways along imaginary and often arbitrary lines—and chances are, even in the best of times, you’ll be met with a certain dose of concern. But when that portal lies smack in the middle of the most border-crazed region of the world, along a convoluted and porous frontier, and in a place notorious for its smuggling, concern crystallizes into apprehension. I’m in a beat-up cab making a bee-line for the Ibrahim-Khalil border crossing connecting Turkey and Iraq—one of the Middle East’s busiest and most important gateways. Two Iraqi travellers and I are making our way from the dust-blown Turkish town of Silopi to the Kurdistan region of Northern Iraq, whose beginning is marked by a range of jagged, desolate mountains looming in the distance. As we push closer, scenes of harshness unfold through the shattered windshield outside: a line of dust-bathed trucks stretching in a queue for several kilometres awaiting customs clearance; a horse-drawn buggy overturned on the side of the road, its cargo strewn hither and thither; and a landscape of semi-arid bleakness marked by rusted oil depots and mysterious fenced-off zones. For the last month, I have been travelling through Turkey’s Southeast Anatolia region. 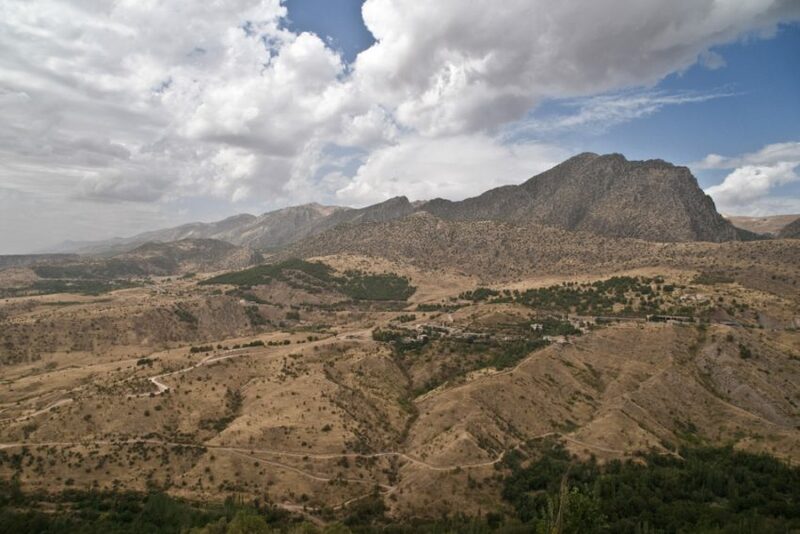 It is a mostly rural area populated by a people known as the Kurds—an ancient mountain people who have inhabited the area from time immemorial. My travels through this breathtaking but rugged terrain has paid dividends in the form of ancient towns, remote alpine hamlets, and a people whose hearts and generosity are greater than the span one’s outstretched arms could describe. At intervals along this wandering I have come into contact with travellers who have recently emerged from northern Iraq. Their stories are consistent: the Kurdistan region of Iraq, they say, is safe and open for business. Not only does it bear no resemblance to the rest of Iraq (still crippled as it is by strife), but it is also virtually its own country – both friendly and welcoming for travellers. The impression conveyed is of a resilient region existing on the cusp of a forbidden no man’s land. I’d known that Iraqi Kurdistan existed as a kind of safe haven, largely out of reach of the chaos to its south. I’d made a brief trip to the enclave itself several years before. Back then, there were few modern amenities in most places and even fewer travellers venturing there. The ones I was now meeting, and the stories they were relating, were telling a different tale. Emboldened by these reports, I decided to widen the scope of my travels to include this seemingly brave new land. We near the gateway, and I am under no illusions that the crossing will be trouble-free. No matter what pseudo-Shangri-La was supposed to exist on the other side, this was still the Iraqi border. The area is heavily militarized, and Turkey’s relationship with the Kurds (both its own Kurdish population and the Kurds of Iraq) remained highly problematic. And, the prickly matter of Kurdish mountain rebels and their on-again, off-again fight against the Turkish army diminishes in my mind the likelihood of a smooth crossing to the other side. When we arrive at the border, it is even busier and larger than I had imagined for such a lonely corner of the Middle East. Countless cars and trucks await clearance at Turkish customs. Our driver Mehmet, whose everyday job it is to ferry travellers back and forth across the frontier, finds a cabbie friend near the front of one of the queues and cuts directly in front of him. He then grabs our passports and runs into an adjacent building to make photocopies and attend to some administration, all within five minutes. Rather than encountering hassles, we are met with a stupefying display of Turkish civility and efficiency. After a quick look in the car, a few questions, and some Turkish Lira changing hands, the Turkish customs official nonchalantly, and with a dash of humour, waves us through. I am completely taken aback. Surely, things will not be so simple on the Iraq side, I say to myself. An official waves us into a parking lot next to a spanking new glass customs building. The inside looks and feels like a newly built airport terminal with polished floors, plush vinyl chairs, air conditioning and scores of wide-screen televisions broadcasting Kurdish music videos. An upbeat air permeates the room. Military men, families, students and businessmen sit waiting for their numbers to be called as mustachioed men wearing traditional head scarves and baggy pants come around serving freshly brewed Kurdish coffee. 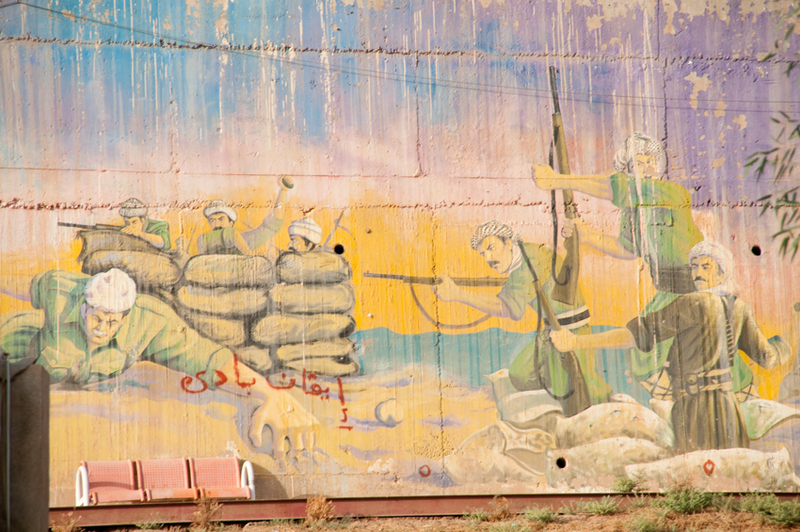 Giant-sized portraits of Iraqi-Kurdish politicians preside over the scene. Before I have a chance to down the dregs of my impeccably brewed coffee, Mehmet waves me over to the customs desk. A uniformed customs woman in her early 30s with long brown hair is holding my passport. “You are from Canada?” she asks with a somber look. She rifles through the pages of my passport, closely scrutinizing several border stamps from nearby Middle Eastern countries. She then finds an empty page, stamps it, smiles, and hands the passport back. This time I feel nothing but shock. Not only does the anticipated interrogation not materialize, but I also realize the Kurds have not levied any fee for the visa (as they did in Turkey). It was free! For a moment, I’m reminded of the days of the pre-9/11 Canada- U.S. border crossing when you could coast through with just your birth certificate and the shirt on your back. But this was supposed to be Iraq! Barely 20 minutes later, I’m hurtling down a mountain road in a slick new Mercedes-Benz beneath a range of spectacular peaks. I ask my new driver, the gargantuan personality known as Abu Piro, how it is I could have crossed the border so quickly and so easily. Abu Piro, whose voluminous moustache curves like a 19th-century Kurdish chieftain’s scimitar, brandishes a smile as wide as the Tigris River. He then bursts out laughing and pats me on the shoulder reassuringly. After years of living and working in the Middle East, you learn that it’s easy to be caught unawares by some sudden development, or change of policy, like the relaxing of a previously difficult border crossing. This is especially so when it comes to Kurdistan. There is little international media coverage here, and even with what little publicity it has garnered in recent times, the Kurds remain an unknown entity. Not only do they exist geographically on the margins of the region (and even farther away from its most pivotal dramas), but, more importantly, they have no country of their own from which to draw attention to themselves. Numbering anywhere from 25 to 30 million people, and concentrated in several countries in the Middle East and the Caucasus, the Kurdish people are widely considered to be the largest stateless people on Earth. Their ancestors were Indo-European and Aryan tribesmen that migrated to the Zagros Mountain region roughly 4,000 years ago. There, they spread out and settled over the area where the modern states of Turkey, Iraq, Iran and Syria today converge, adopting nomadic and semi-nomadic herding lifestyles and consolidating their own language and culture. The word “Kurdistan” (Land of the Kurds) refers to both this geographical area, and the culture of a people. A tradition of tragedy runs through their modern history. The Kurds found themselves divided when the boundaries of the modern Middle East were drawn up by colonial powers in the early 20th century. Ever since, they’ve been struggling against attempts in each of their adopted countries to be assimilated, and are often denied the right to express their culture. The fact that the Kurds inhabit an area of geopolitical importance, characterized by military concerns, unstable borders, as well as precious water and oil resources, has only increased the mistrust and hostility in the countries where they reside. Some argue that of all the Kurds, those in Iraq have had the worst of it. Like other Iraqis, the Kurds had a hard time under the country’s late president, Saddam Hussein. For years he waged war on them, putting down successive waves of rebellion against his heavy-handed rule. 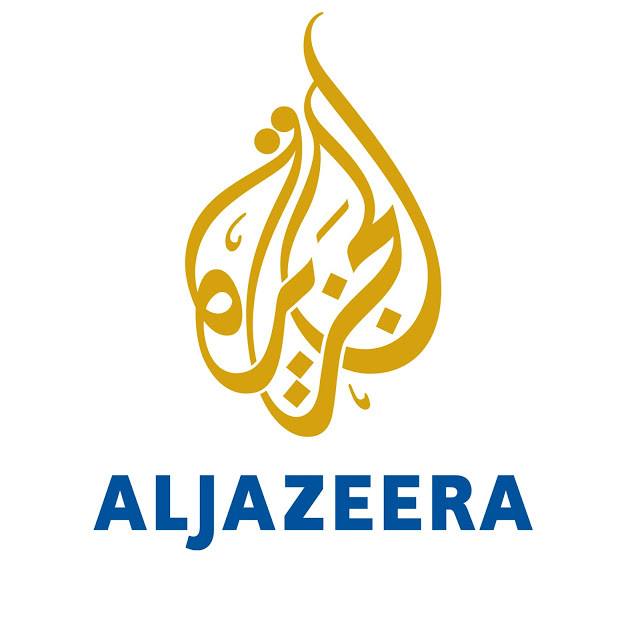 Media images in the 1980s of poison gas attacks perpetrated by the Iraqi military against Kurdish villages, killing thousands, and revealed in the run-up to the 1991 Gulf War, introduced the world to a previously unknown people. But as suddenly, and unexpectedly, as the fortunes of Saddam Hussein shifted with the American invasion, so too did the fortunes of Iraq’s Kurds. After the first Gulf War, the United States and the international community created a safe haven for Iraq’s Kurds to protect them from Saddam, who was still a threat to them. In 1991, as part of the U.N.’s no-fly zone and the U.S. military’s Operation Provide Comfort to help Iraq’s Kurds, a proverbial line was drawn in the sand which the Iraqi military was forbidden to cross. So began the period of self-rule for Iraq’s Kurds, which has continued until this day. After the more recent 2003 American invasion of Iraq, and the ouster of Saddam Hussein, the drive by Iraq’s Kurds toward self-rule kicked into high gear. Though still part of Iraq, this area, which calls itself the Kurdistan Regional Government (KRG), is for all intents and purposes, its own country. It has its own government, army, flag, national anthem and passport stamp. The catchphrase “semi-autonomous,” which the international press has been using for years to describe the area, is a misnomer. The region is autonomous, and some would even argue is a de facto independent state. I’m here to see firsthand what observers have been calling “The Kurdish Miracle”— in reference to the safety and relative economic prosperity in this corner of northeast Iraq. I’m also interested in seeing the growing juxtaposition between traditional Kurdish culture, which survives in the rural areas, and the new western-style culture, which has taken hold in the region’s cities. I visited Iraqi Kurdistan in the late spring of 2003, immediately following the beginning of the second Gulf War. I had gone there to document the aftermath of the conflict. 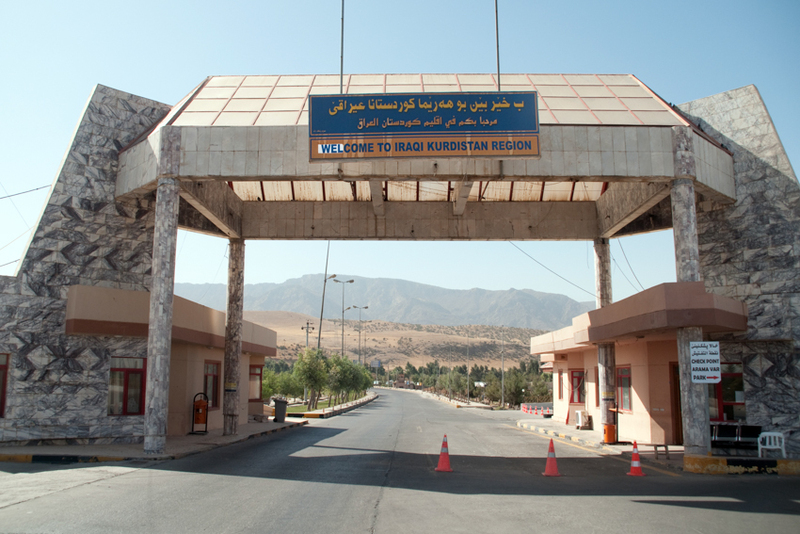 On that occasion, I crossed into Kurdistan by land from the troubled Iraqi city of Kirkuk, just to the south. My time in Kurdistan was spent mostly in the city of Suleimaniya and a few surrounding villages near the Iranian border. At that time, Kurdistan was already becoming a self-defined, if still somewhat nebulous, entity. Unlike today—with its largescale city development and bold moves on the regional political stage—a sense of caution and tentativeness underscored its ambitious drive to take itself out of the Iraqi fold. One of the less obvious, but still visible, indications it still had far to go was that it was completely bereft of travellers. That’s much less the case now. And for good reason. The region where Kurdistan resides is one of the most ancient, naturally endowed, and culturally rich in the Middle East. A combination of antiquities, high mountain ranges, pristine nature and traditional culture is now drawing a vanguard of curious, foreign adventure seekers from neighbouring Syria and Turkey. Word is fast getting out. Internet travel forums and chat sites are abuzz with talk about this erstwhile badland now open for discovery. Guidebooks have officially OK’d the region from the standpoint of safety. “Leave misconceptions behind to discover one of the newest travel destinations in the Middle East”, says one recent edition of a popular guide-book featuring Kurdistan in an otherwise pared-down section on Iraq that brims with warnings and disclaimers. 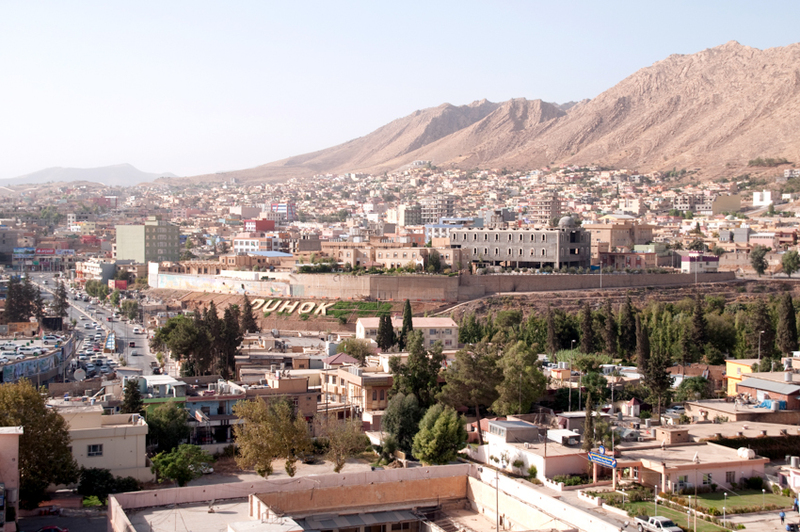 None of this potential has been lost on the Kurdistan Regional Government, which has been quick to try and market Kurdistan as a destination separate from the rest of the country. “The Other Iraq” has been chosen as Kurdistan’s marketing slogan in a series of recent ads and commercials plugging the northern enclave. On the KRG’s website, a fact sheet entitled “Travel to the Kurdistan Region” boasts proudly of how both diverse and secure a place it is for curious travellers. “While Middle Eastern customs of business, dress and behaviour are closely followed, Kurdistan is also progressive, pluralistic and relatively open…Foreign visitors are warmly welcomed.” And the security situation, it adds, is “very different” from the rest of Iraq; fewer than 1,000 U.S. soldiers are stationed in Kurdistan, and not a single coalition soldier has lost their life there since the conflict began. Clearly these developments have not been falling on deaf ears: according to the KRG, more than 132,000 foreign tourists came to Iraqi Kurdistan in 2009, an almost 150 percent increase over 2007. 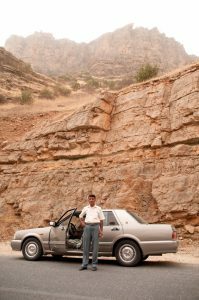 As I head south along the dusty plains of Ninewa province toward the city of Erbil, the self-styled capital of Iraqi Kurdistan, I’m struck by a sense of stability and the single-mindedness of the Kurds to make their experiment in self-rule work. By the time one reaches the outskirts of the city, one can see the drive toward a westernizedstyle development in full throttle. New hotels, shopping malls and housing projects are everywhere. A massive $400-million high-tech airport in Erbil has just been built, connecting Kurdistan to the outside world through a handful of regional and international air carriers. The picture is many worlds away from the morose scenes to the south in parts of Mosul, Baghdad and Basra. And yet, technically, this is still part of Iraq. “You are impressed,” says Najan Youssef, a bespectacled old Assyrian man with a deep, baritone voice and a presence like that of an elephant. He is sitting beside me in the shared cab. He’s been watching me stare out the window and no doubt wonders who I am, and what I’m thinking. Youssef tells me he is the mayor of the town of Shaqlawa, which lies 50 kilometres to the northeast of Erbil. It is an elevated town nestled in natural surroundings that draws many visitors in the hottest months of the year to partake in its cool, clean mountain air and festive mood. 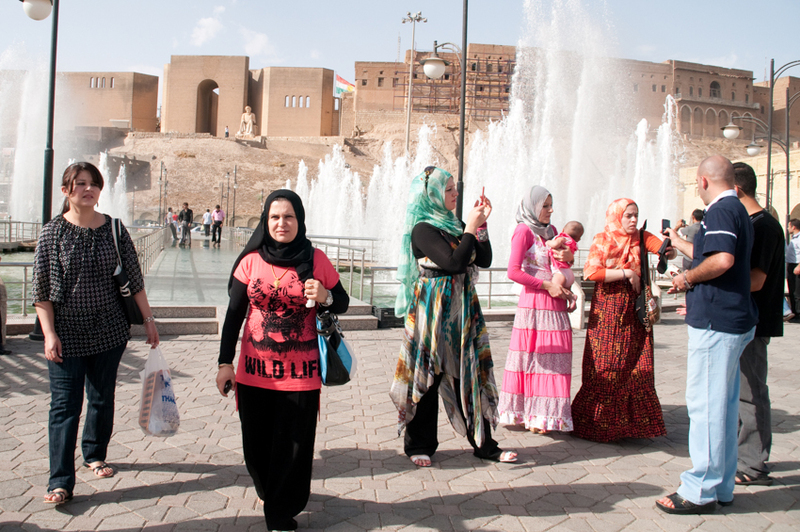 When I tell Youssef I am a journalist, his eyes light up and he talks about the effort to turn the Erbil area— and Kurdistan in general— into a new, Middle Eastern, tourist Mecca. Deriving its name from the ancient Sumerian Urbillum (meaning “city on high ground”), and known to Kurds as “Hawler” (pronounced “How-LAIR”), Erbil is one of the oldest cities on Earth. Historians date its origins as far back as 6000 B.C. Today, its old town sits atop a massive earth mound made from the decayed ruins of all previous incarnations of the city. The walls of its famed citadel can be seen from kilometres away in all directions. Both the downtown core and the large bazaar district lie at the foot of the mound, with more recently built suburbs sprawling out from it. I spend an afternoon walking through the eerily quiet old town, which is almost entirely empty of people. I duck under a construction cordon and head toward a cluster of old villas under renovation. The homes are hundreds of years old, stately and immense, often with open-air courtyards and commanding views of the city below. Once these buildings have been restored, work will begin to resuscitate three mosques, an Ottoman era bathhouse and a host of other buildings and landmarks located nearby. Following the restorations, there are plans to construct museums and boutique hotels on the site as well as to begin a long-term archaeological dig on the mound, which is hoped will yield a vast treasure of findings. As I come down from the citadel and spend the remainder of my day sauntering through Erbil’s bazaar with its many merchants hawking food, spices and knickknacks, I still find it hard to reconcile Kurdistan’s odd mix of qualities. Although Kurdistan still feels very much like Iraq, its secure and relatively affluent position is highly reminiscent of some other place. And in the same way this new world—with its cellphone-infatuated people, shiny new cars and modern amenities—is a world away from Iraq, so too is it distant from some other Kurdistan to which it claims to be a part, and which I had yet to see. Suddenly, my mind’s eye catapults across the dry plains north and east to a rugged no man’s land of high peaks and mountainous recesses. There, life is simple and pristine, but also austere and harsh. It is the ancestral homeland and rocky crucible in which the Kurdish soul was fashioned. And it beckons with an ancient ferocity. As if on cue, my growing intentions are reinforced. In the bazaar, a tall Kurdish man draped head-to-toe in traditional garb and selling pomegranate seeds asks me whether I’ve been to his village. It’s a place no bigger than a tiny dot on a map, located in a range of gargantuan hills near the Iranian border. I tell him I had not yet been to that part of Kurdistan, and that I have plans to spend much of my time to come in Suleimaniya. The man furrows his brow and makes a disapproving clicking noise. “No Suleimaniya! Kurdish people in the big mountains. You want real Kurdistan, you go there. 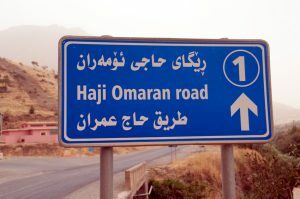 To Qandil, Hajji Omran. Up, up, up,” he says, shaking his hand in the air with a far away look in his eyes. The ascent leading to the highest and most remote corner of Kurdistan is akin to taking flight into the sky. 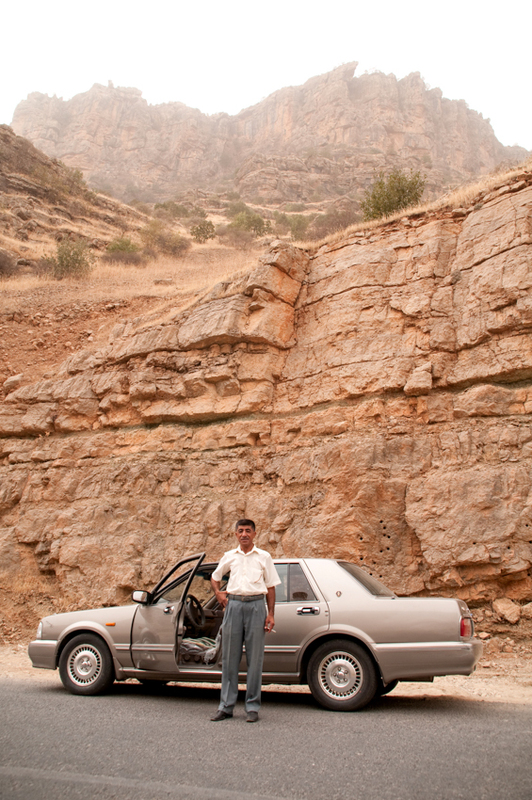 My pilot and makeshift guide is Ibrahim Ismael, a 50-year-old taxi driver from the town of Shaqlawa. He is a small-framed and mild-mannered character, given to chainsmoking and long bouts of silence broken by sudden jokes and bursts of laughter. I made his acquaintance on a street corner in Shaqlawa, where he accosted me light-heartedly with an offer to take me on a journey. After three days of intermittent bargaining, we agreed on a reasonable price for a long day trip along a famed roadway that cuts through some of the toughest terrain in all of the Middle East. We are driving along the Hajji Omran Road, also known as the Hamilton Road. 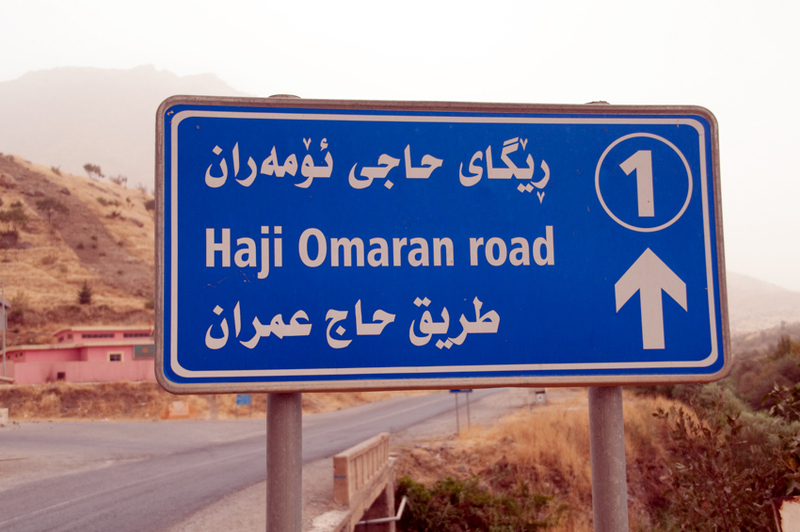 It is a highway running between Erbil and the border crossing of Hajji Omran on the Iranian frontier. The road is named after Archibald Hamilton, a New Zealand engineer in the British Army who helped to build the road between 1928 and 1932, using local workmen. The British Empire a the time wanted to create a shorter and more direct overland route that would connect the Mediterranean with Iran, and, ultimately, India. Today, the road is widely viewed as an engineering marvel. Hamilton, an adventurer at heart who prior to building the road was a chief of public works in southern Iraq, accepted the commission excitedly as it meant he would get to live in virtual mountain exile in some of the least explored parts of the region. In 1937, he published an account of his adventures in his travel classic, Road Through Kurdistan. Hamilton recounts his four years living outdoors among an army of workers and nearby tribal peoples. His book is filled with colourful accounts of his exploits. As explorer, Hamilton mapped out unseen terrain and reconnoitred inaccessible river gorges and canyons; as diplomat and de facto governor, he was forced to manoeuvre the tricky politics of the various tribesmen whose regions the road passed through; as engineer and work boss, he made cunning logistical decisions and demonstrated the leadership required to keep a company of multi-ethnic workers from fraying; and as military man, he enacted contingencies to deal with threats to his camp from armed bandits. On top of this, he had to contend with repeated bouts of malaria, dysentery and difficult periods of solitude. As we push further into this harsh wilderness of rock, I begin to appreciate just how difficult Hamilton’s task must have been. “You want to hear Kurdish music?” asks Ibrahim smiling, as he digs through a pile of CDs while navigating the increasingly winding road. He pops one of the discs into the player and an epic soundtrack of folkloric party music suddenly frames our journey. It is an overdriven and high-octane sound consisting of shrill electronics, phase-shifted keyboard solos and frantic rhythms careening at breakneck speeds. There is a euphoric coarseness to the music that matches the harsh and beautiful landscape around us. It becomes a parallel narrative, a trance-inducing cacophony of ancient and modern instrumentals to which our vehicle virtually gallops. 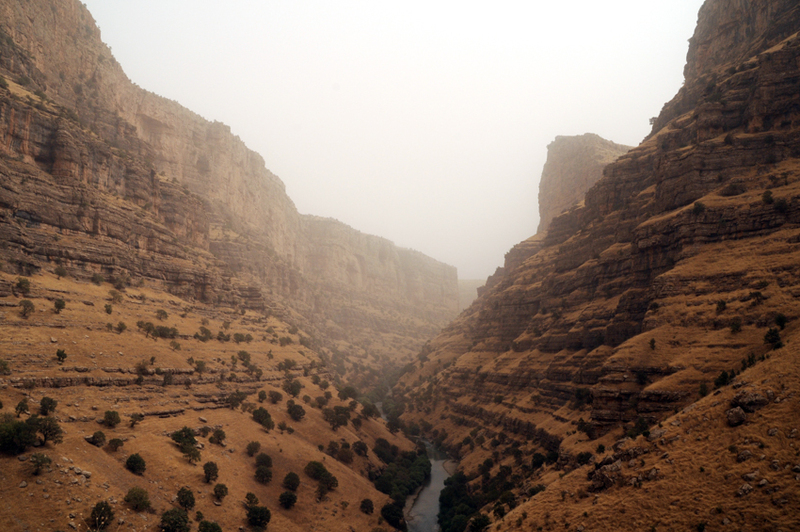 We reach the area of Gali Ali Beg, the site of the deepest canyon in the Middle East. Here, the Hamilton Road splits into two segments: a high road that runs near the top of the canyon, and a low road that runs at the bottom alongside the rivers that carved it. We take the high road and navigate hairpin turns with cautious precision, while looking down on a drop that must be well over a thousand feet. We drive through the canyon, past two waterfalls where Iraqi tourists come to drink tea and marvel at the wonder of fast-moving water. Just ahead is an even more profound and eerily convoluted landscape. Visible through a fine mist of dust are the jagged soaring peaks of the Zagros Mountains. They are dramatic, covered in brush vegetation and rise in spectacular asymmetrical contortions. We’ve entered into the deepest reaches of Kurdish country where Iraq meets the frontiers of Turkey and Iran. It is an area of tribal nomads and small isolated towns where even the Kurdish Regional Government has little control. At the last checkpoint on the Hamilton Road, we are told not to go too far down any of the smaller side roads that thread even deeper into the mountains. With the borders being so close, and not being respected to the letter, venturing too far off the beaten path could mean a chance encounter with either the Turkish or Iranian armies. Also present in these mountains are members of the Kurdistan Workers Party, also known as the PKK—a Turkish-Kurd rebel group fighting the Turkish army and which has its secret mountain camps on the Iraqi side of the border. We heed the checkpoint officer’s warning and continue strictly along the main road, pushing ever higher into the mountains. After passing the former British colonial town of Rowanduz, we come across a large wedding celebration taking place in a quarry on the side of the road. Men and women dressed in the traditional baggy Kurdish pants and colourful dresses respectively mingle together sipping soft drinks and posing for photographs with the bride and groom. An older man at the wedding hears that we’re travelling east and hitches a ride with us to Choman, the next town along the road to the Hajji Omran border crossing. Ibrahim takes a break from speaking English with me and delves into an animated conversation with the man, sharing cigarettes and gossip about local goings on. Our caravan grows when a thunderstorm breaks out and two young girls dressed in school uniforms flag down our vehicle and hop in after requesting a lift. After dropping off our passengers and passing a couple of buses plying the road to Iran, we finally arrive at the village of Hajji Omran and the border crossing. It is a tiny frontier town surrounded by high, rolling mountains. In some ways it feels like we are perched on the edge of the world. “Hajji Omran,” declares Ibrahim, as he puts his car into park at the end of the main drag. It has taken us close to seven hours to drive the almost 200 kilometres from Shaqlawa. Just ahead of us is the border and in the hills above are guard posts dotted along the otherwise invisible frontier. There is a deep silence. We exit the car and take a look around. I see a few flashy vehicles coming from Iran that are driven by businessman types. They make their way to a small strip of shops where a another group of men stand haggling with each other outside. I ask Ibrahim what is going on. Another scene catches my eye. I see a few cars loaded with people, also crossing from Iran, carrying huge loads of belongings on the car roofs. Again I defer to Ibrahim. He turns to me again, abandoning his mirthful disposition. I was intrigued. And of course, I took his words to mean I should do the opposite. I only had a few days left on my Kurdistan tourist visa, but I resolved there and then that I would find my way to Lalish, and this mysterious gathering of Kurdistan’s notorious devil worshippers. The Yezidis have always been a people shrouded in mystery, and consequently have been largely misunderstood, considered suspect, and at times persecuted. What makes the Yezidi religion so hard to pin down is that there are no surviving texts or scriptures. It is an oral religion. That, along with a cult of secrecy permeating it, has caused Yezidism to be poorly understood, sometimes even among Yezidis themselves. But more than anything it is the term “devil worshipper” which is most frequently attached to the adherents of this elusive sect. In the Muslim, Christian and Jewish faiths, the well-known story of the fallen angel Lucifer, also known as Satan, who disobeyed God and was demoted to rule the fiery realms of hell, has a somewhat different twist in the Yezidi faith. In the Yezidi story of creation, the rebellious angel, who in this version is called Azaziel or Malek al- Tawwus (The Peacock Angel), was later redeemed by God and made chief of all the angels. The Yezidis worship and pray to the Peacock Angel, which has caused others who live in their midst to refer to them by the pejorative ‘devil worshipper.’ A tenet of the Yezidi faith that both good and evil are of equal importance in the world, and that one cannot exist without the other, has not helped their case. European travellers who wrote about their encounters with the Yezidis in the 19th and 20th centuries tended to perpetuate this misnomer without much scrutiny. Gertrude Bell, the celebrated writer, explorer and British political agent in the Middle East, travelled to the Yezidi heartland in 1909 and wrote down her impressions in her book Amurath to Amurath. Now I too was entering that same country and headquarters. After Hajji Omran, I made my way to Duhok, where I found another driver to take me to the holy Yezidi sanctuary at Lalish, about an hour’s drive away. As I would discover, Lalish is not actually a town, but a holy site consisting of spire-topped mausoleums tucked away in a valley below scrub-spotted hills. The area, which is sacrosanct, has no actual residents apart from a few custodians. 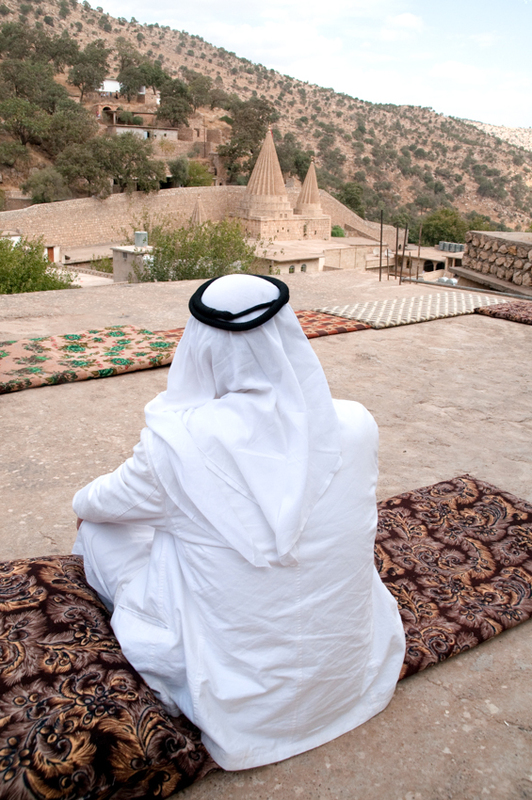 The Yezidis maintain that Lalish is the place where the universe began. We approach the entrance to the valley, marked by checkpoints and extra-heavy security. My driver, who is Yezidi, tells me about the annual religious gathering, known as the Eid al-Jamayeh (or Feast of the Assembly), in which we are about to take part. He describes it as an enormous outdoor family reunion that brings together all Yezidis, not just from around Iraq, but also from the wider diaspora across the Middle East and Europe. When I ask him how many Yezidi Kurds there are in the world, he throws me a somewhat terse look. “All Kurds were once Yezidis, but the Yezidis were never Kurds,” he says, sounding as though he had delivered that line a thousand times before. It is a sentiment other Yezidis would reflect in the coming days. Many of them consider themselves an ethnicity apart from the Kurds, despite speaking Kurdish and living in Kurdistan. The Kurdistan Regional Government refuses to recognize them as a separate group, claiming them as their own, which helps to boost its numbers and increase its political weight vis-a-vis the rest of Iraq. There is no official tally of their numbers, and depending on whom you ask, there are anywhere between 500,000 to 1.5 million Yezidis in the world today. Roughly half a million Yezidis are believed to be living in Northern Iraq. My driver arrives at a makeshift parking lot within sight of the Lalish mausoleums. I leave the car and continue my approach uphill on foot. Whole families are arriving in packed cars, carrying chairs, tables, cushions, pillows and other amenities that will help to sustain them over the coming week of festivities. Some of them carry their things in food aid sacks with the names of humanitarian organizations written on them. I pass sheltered stalls containing large vats filled with hundreds of bottles of water and cans of pop. Shawarma and kabob sellers also line the route. Judging from the amount of food and drink being hoarded and prepared, it appears that many thousands of people are expected at the event. At the sanctuary there are hundreds of people milling about. Many of them are setting up camp in empty spaces beside temples and along parts of the hillside. The first thing I notice is that every person is walking around in his or her bare feet or socks. I quickly discover it is forbidden to wear shoes anywhere on the sanctuary grounds. I walk to a rotisserie chicken stand and ask the attendant if I can leave my boots there for the day. He graciously agrees and I begin exploring the sanctuary in my socks, being careful to avoid stepping on ground wet from butchers washing and preparing fresh meat for the day’s meals. 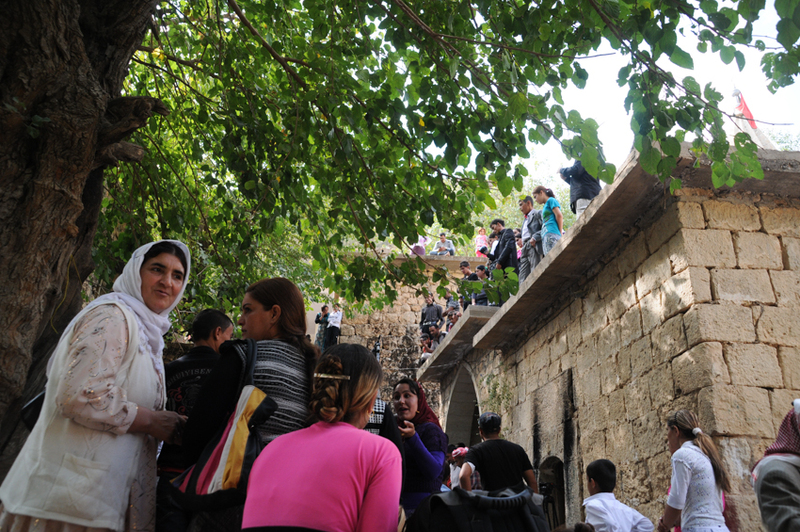 All around, Yezidi men, women and children line up at the various temples and mausoleums, donating money and offering prayers. Next to one of the temples is a congregation of men of striking appearance who are sitting in a semicircle on the ground. Many of them have long moustaches and are draped in immaculate white robes. A middle-aged man among them, and who is wearing western trousers and a collared shirt, approaches me and introduces himself. After a fuller round of introductions that include meeting the mustachioed young dignitaries (who, I am told, are Yezidi holy-men-in-the-making), Sheikh Pasha brings out tea and a bowl of nuts and sets it beside me. He agrees to field some questions concerning the beliefs of the Yezidis. Although he is forbidden to reveal certain information, he speaks a bit about reincarnation—one of the tenets of the Yezidi faith. He also adds that one cannot marry or convert into the faith, and that Yezidis are divided into higher and lower castes. There is no mention of either Satan or the Devil that sensationalists cling to when dealing with the subject. I ask him what sorts of things he would like outsiders to know about the Yezidis and their religion. At that moment, a few feet away, a group of bearded musicians gathers together with drums and wind instruments. Sheikh Pasha grabs my arm and we go over to watch the performance in which dozens of people gather. A line of men and women holding hands forms into a dance circle around the musicians. They bounce and move in unison with the music, which is repetitive and haunting. Ululations ring out from the crowd. 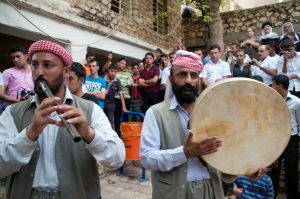 One of the musicians, a man in a red-checkered head scarf walks around requesting alms in return for “Baraka,” or divine grace. Just then, a middle-aged Yezidi man holding worry beads, and who speaks with a slightly broken British accent, approaches me. He has a playful smirk on his face and we exchange pleasantries. Then he pulls me aside. I tell him that by coming to Lalish, I see there is nothing to the claims of critics throughout the ages that he and his people are devil worshippers. He fixes his gaze at me with intensity. 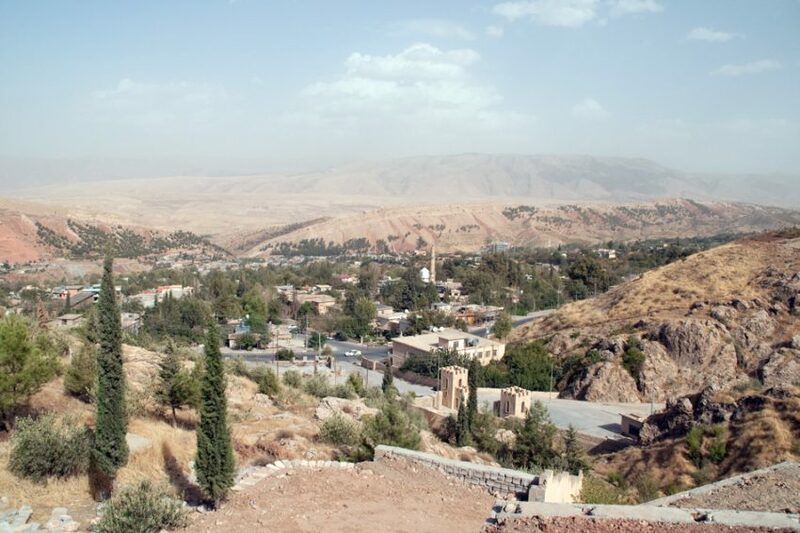 Before I leave Iraqi Kurdistan, I make a quick and final stop in the city of Amedi, which several people strongly recommend to me. It is an ancient and dramatic fortress town perched on a mountaintop in the Beshesh range near the Turkish border. In the valley below, a few kilometres away, is the town of Sulav. It is a place popular among Iraqi Arab tourists, who come by the busload on weekends to picnic and enjoy the nearby greenery. I walk along the edge of town with a view over Sulav and the rugged mountains stretching in the distance. I reflect on how I have had nothing but welcoming experiences from a people whom I consider to be some of the most hospitable in the world. And yet apart from the rare sighting of a handful of travellers, there was still relatively few westerners visiting this corner of the world. As I round a corner, I meet a young Kurdish man named Aryan. We strike up a conversation and walk together along the town walls. After some time he grows silent and repeatedly looks at me before again speaking. “Why are you travelling alone?” Aryan asks. “Where I come from, people work too much and friends are often too busy to travel,” I tell him. “Is that all?” he asks, unconvinced. I decide to be more frank. I try to make sense of what he’s trying to get across. A light bulb suddenly goes on in my head. He then walks me to the taxicab that will ferry me to the city of Zakho, a few kilometres from the Turkish border. From there, I will hire another vehicle to drive me out of this part of Iraq that is not quite Iraq, a country that is not yet its own country, but which is likely yet to become one, and at the same time has always really been one. This article appeared in the April 2011 issue of Outpost magazine.